In today's post few more interesting experiences of devotees are shared. Thank you for letting me share my experience. My name is Rachna Sharma and I am married and blessed with a daughter. We stay in Dubai. I have been connected with Sai Baba since 2006 and ever since that my life has been kind of guided and transformed to a better one by Sai's grace. I wish that everyone experiences the same. Well like I have mentioned, each hurdle of my life has been overcome by Sai's grace. What more could I ask for. 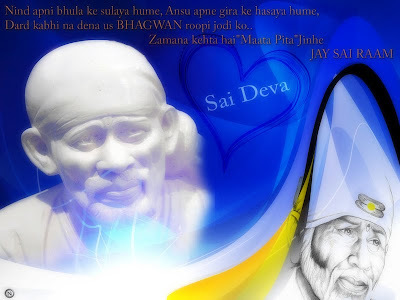 I want to mention that my connection with Sai started because of my parents, who are also Sai devotees. My experience is as follows. I got married and settled with my husband in Bahrain, where he used to work in 2008. We had a perfect life and suddenly somewhere in July 2009, my husband started facing a lot of problem from his company due to internal politics. He used to be very upset and this caused a lot of tension at home. I was on my family way and in my second trimester. I was very upset and used to cry to Sai day and night to help my husband find a new job else we would have to leave the country. My husband found a new job finally. We were very happy again, but man proposes one way and God another. So protests started in Bahrain in 2010 and that is the time I delivered my little girl. So it was not wise staying there anymore. Hence dejected and sad, we left everything behind and came back to India.